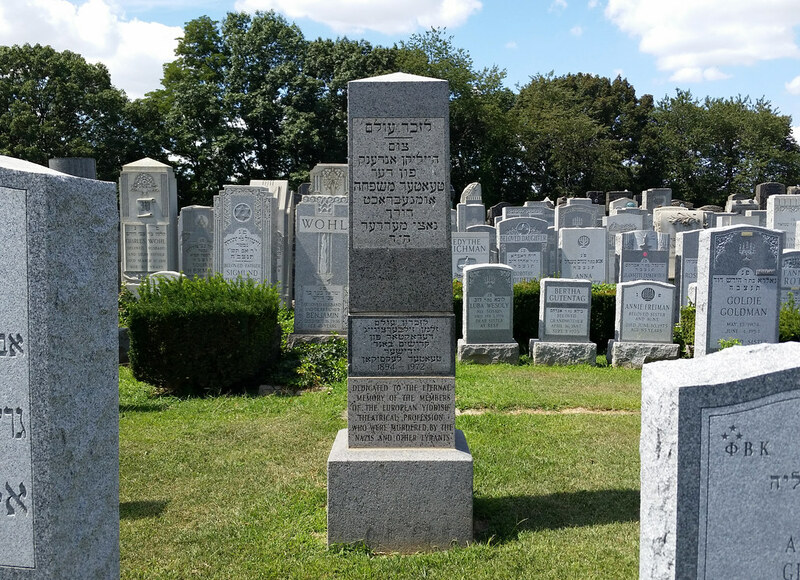 Today my family and I paid our annual visit to my grandparents' gravesite at Mount Hebron Cemetery in Queens. Afterward, we walked over to the neighboring Yiddish Theatrical Alliance section, where my aunt and uncle were delighted to discover Molly Picon is buried. After leaving Mount Hebron, my family and I headed to lunch at Annam Brahma, in the heart of Sri Chinmoy territory. 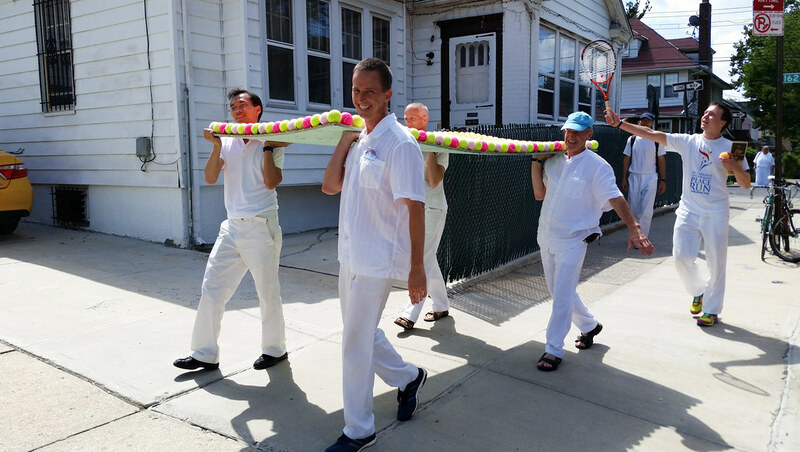 When I saw these guys — obviously disciples of the late spiritual leader — walking down the street carrying a large panel of tennis balls, I was initially puzzled. 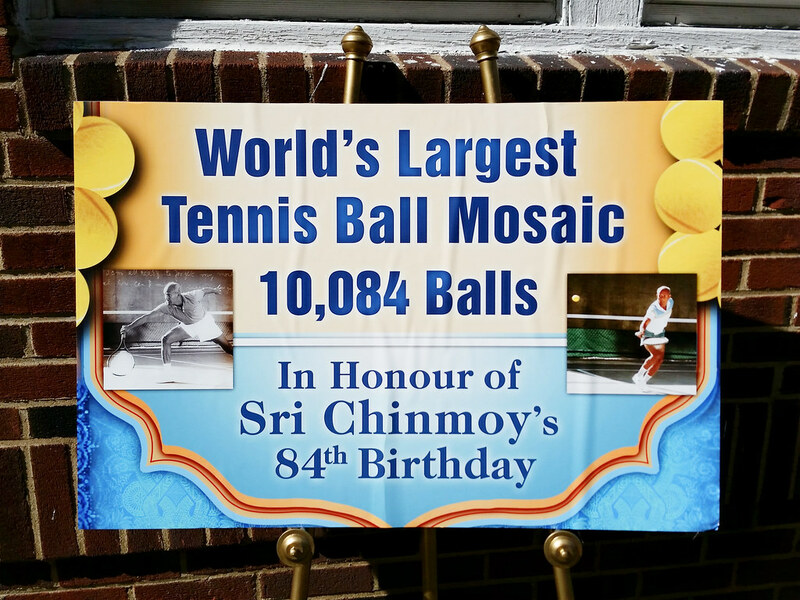 But then I remembered Sri Chinmoy was born on August 27. And I knew his followers, among them the world's foremost record-setter Ashrita Furman, like to set an unusual world record in his honor on his birthday each year. This year's record? 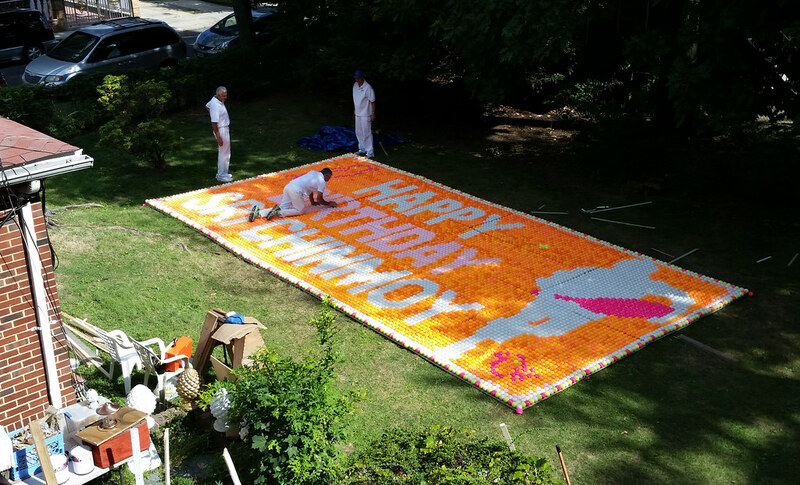 The world's largest tennis ball mosaic. 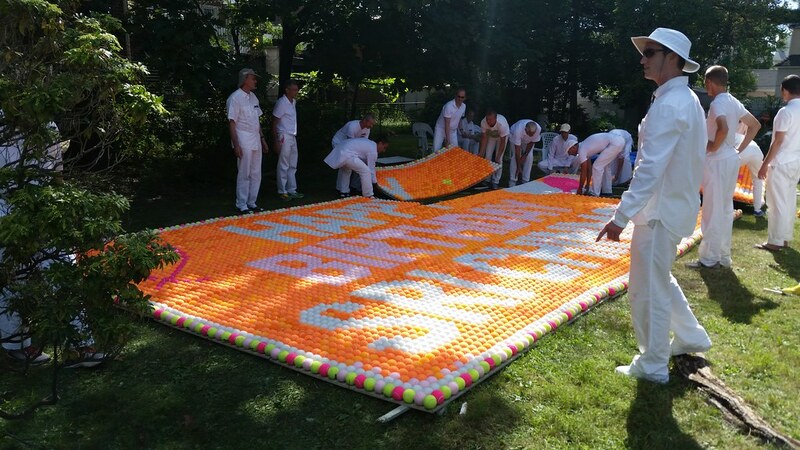 10,084 balls for the guru's 84th birthday. His 76th birthday, the last one he was alive to see, was celebrated with a 76-foot-tall pencil that received a visit from the cops after being picked up by satellite surveillance. That's Ashrita crawling over the mosaic to smooth out the seams where the individual panels meet. It looks to me like the mosaic is 140 x 72 balls, with one extra ball at each corner. Which does indeed add up to 10,084. In case you're wondering, the reason I knew Sri Chinmoy was born on the 27th is that the original 1996 version of what is now the Self-Transcendence 3100 Mile Race was 2700 miles long, a distance based on his birthday. Then he increased it to 3100 miles the following year because hey, why not, and he was born in 1931.